Japan's automakers employ 407,000 Americans at these 29 plants and 34 R&D and design centers. 1. Japanese automakers like Toyota, Honda, and Nissan are responsible for more than 407,000 jobs in the U.S. 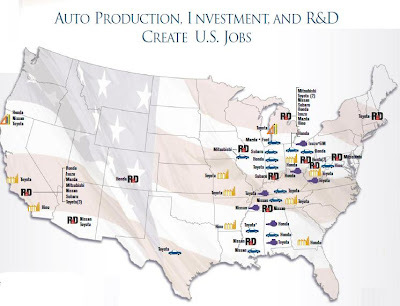 The vast majority of employees are those working at Japanese auto dealerships in the U.S., but Japanese automakers employ 50,000 American workers at 29 American vehicle, engine and parts plants, and another 4,000 at 34 major R&D and design centers, reflecting $34 billion of investment in the U.S.
2. Japanese makers are producing most of the cars they sell in America in North America -- 68% altogether. 3. Exported vehicles from Japanese plants in the U.S. last year increased to more than 145,000, up from 94,000 in 2009. With a strong yen today, the trend will continue, and will be be supplemented by new exports of U.S.-built Toyotas to South Korea following the recent ratification of the free trade agreement. Those are some of the facts highlighted by USAToday based on a Japanese Automobile Manufacturers Association report being released this week. And my home state of Indiana thanks them! Maybe I'm mistaken, but aren't some of these plants non-union as well? How many other jobs were consumed? Surely that is not all net new jobs. "How many other jobs were consumed? Surely that is not all net new jobs." It's hard to say. Employment numbers for Japan are hard to come by. If a foreign automaker invests in manufacturing in the US, I suspect that all the US jobs involved are new, with any lost or not created being in Japan.
" If a foreign automaker invests in manufacturing in the US, I suspect that all the US jobs involved are new, with any lost or not created being in Japan"
if you assume that only a certain number of cars are sold per year then new competitors don't bring new jobs - they just take part of the existing demand which will result in less jobs in the plants that previously met the demand. you cannot create more demand overall by offering new/different/better products. if people buy more of one thing it means they buy less of something else. the only way they buy more is if they have more money than they used to. whether the Japanese cars are made here or overseas - they bite into the existing demand for American-made cars. this is not good nor bad. it's no different than if a new American car company came into being selling a different car that then diverted buyers from existing cars. Quote from Larry G: "you cannot create more demand overall by offering new/different/better products." There is not some finite fixed amount of demand for cars. The demand for 'Japanese' cars (whatever that is) is not only competing with the demand for 'American' cars, but also with the demand for everything else being sold on the market. I think continuing to label these companies as "Japanese" is misleading and dangerous. These are now American companies that are here to stay and must be competed against. The sooner everyone realizes that, the better off we will all be. These are not "slant eye gooks" that killed your grandfather that we can blame all of our problems on and hope for the good ole days that we will soon have after they are kicked out of the country by new laws.
" I think continuing to label these companies as "Japanese" is misleading and dangerous"
my choice of words was meant to convey the fact that they are additional competitors ... I'd certainly include BMWs in South Carolina and Hyundais in Mississippi. Some day we might see Tatas from India ! So does that make Halliburton a Dubai company now walt g? How about Accenture, Foster Wheeler Ltd.,Ingersoll-Rand Co. Ltd, and Cooper Industries Inc. are they now Bermudian companies? The Japanese automakers have their corporate headquarters in Japan, and so I think it's accurate to refer to them as "Japanese" corporations, just like it would be accurate to refer to Ford, Walmart or McDonald's, all headquartered in the U.S., as "American" companies. Global sales and production don't change the reality of where a MNC is headquartered. "if you assume that only a certain number of cars are sold per year then new competitors don't bring new jobs - they just take part of the existing demand which will result in less jobs in the plants that previously met the demand." I only buy Japanese cars, which means I spend less time and money at the mechanic than if I bought some Obama Motors piece of crap. That gives me more time and money to spend elsewhere.
" I only buy Japanese cars, which means I spend less time and money at the mechanic than if I bought some Obama Motors piece of crap. That gives me more time and money to spend elsewhere. " agree. but you are not spending MORE money overall. the increase of jobs in the area you spend your newly-gained money is offset by the reduction in auto mechanics that you used to spend that money on. it's not a net new job created - it's a job for a new product offset by a lost job for the old product. the only way a new, net additional job would be created is in you had net new additional money. "..the increase of jobs in the area you spend your newly-gained money is offset by the reduction in auto mechanics that you used to spend that money on."" Besides, it's unproveable that there's an equal trade-off. "Besides, it's unproveable that there's an equal trade-off"
what's true though is that you're not spending MORE money - you've just changed what you spend it on. that in and of itself does not create new jobs. Walmart comes to town and you switch you buy your groceries but you spend no more than you did before. if there was one employee and mom/pop.. why would there be MORE than one employee at Walmart for the same amount of grocery money spent? that makes it sound like cheaper goods produce more workers.... and that would mean Walmart having to pay two workers for the same amount of total money that employed one worker at your previous mom/pop store. paying two people 1/2 the salary of one job is not really a new net job.. in terms of what those workers themselves would spend ...they spend the same amount... but split between them. the only way you get net NEW jobs is if the demand itself has more money to spend....rather than just spending the same amount in different ways. O.K. I can go with that Professor Mark but then are the companies I listed no longer 'American' companies since they moved their corporate headquarters to Bermuda? I don't understand the point of all the discussion about whether a company is "Amnerican" or "Japanese" or "Bermudan". As far as I am concerned, a company is American if operations and operational decision-making are concentrated in the U.S. Suppose a British company buys an American consumer goods company, but allows that new subsidiary to continue making operational decisions in the U.S. The subsidiary is still an American company, IMO, even though it is not owned by an American corporation. The American Honda Company may or may not be an American company, by my definition. I don't know if operational decisions are made in the U.S. or in Japan. But, truthfully, I could care less. That's the question jet beagle, are those decisions now made off shore too? I don't know what a Japanese or U.S. company is today. Same with cars. Put more simply, they are our legitimate competitors that are here to stay. Continuing to label them as "Japanese" ignores just how "American" they have become and causes problems with the people I deal with every day who think “they” just need to leave to have everything great again. A lot of people do not know or care what an MNC means. We have been blaming foreigners for our problems since the U.S. was founded instead of dealing with our real problems. The "Japanese" label might be technically accurate; however, it is not always connotatively useful. ", and will be be supplemented by new exports of U.S.-built Toyotas to South Korea following the recent ratification of the free trade agreement." Interesting that U.S. assembled cars will be allowed into Korea, because of the elimination of non-tariff barriers. The U.S. gave up on Japan eliminating non-tariff barriers to U.S. cars, that resulted in American assembly of Japanese cars. Free Trade Agreements have been very good to the U.S., because non-tariff barriers can be eliminated for U.S. producers of goods and services. Most economists and econ pundits write and speak of the harm of tariffs, but it is non-tariffs that are the most effective 21st Century barriers to trade. "That's the question jet beagle, are those decisions now made off shore too?" Unless you work for the company, I'm not sure how you can really know. My experiences in large multinational corporations leads me to believe that important decision-making in such corporations is both centralized and de-centralized. But, to me, the bigger question is: what difference does it make where the decisions are made? The American Honda Company employs thousand of Americans. It buys goods from hundreds if not thousands of American companies. The American Honda Company pays taxes to federal, state, and local governments. As I see it, the American Honda Company is much more American than Ford of Europe, the European subsidiary of Ford Motor Co.
"you cannot create more demand overall by offering new/different/better products"
Try telling that to people who buy computer software and hardware.
" more demand " = "more aggregate demand". if you make $100 a week and what you buy gets cheaper and allows you to buy more "stuff" (software, etc), you still don't spend more than the $100 - right? so the logic seems to be that if "stuff" gets cheaper.. more jobs are created..
so if Walmart sells something cheaper does it mean that two Walmart employees will replace one Mom/Pop employee - i.e. the "new" job? how about a common-sense explanation - not a theoretical one? That's because they use permatemps + the enticement of few(and largely unattainable) FTE jobs a lot in the North. Not much different than what they do at home in Japan, except that they seize the passports of the folks doing the work over there. Still would think that GM and Chrysler's two-tier arrangement is better, for it doesn't build in distrust through the extensive use of permatemps. As for Ford, they're becoming a lost cause as they turn all their inventory to Eurotrash. It is bad in that it means less American-sized and powered cars. The proverbial Al Gore still gets to have their expensive SUV, but forget any normal person getting much more than a glorified golfcart with a ton of bling. Whether the normal person wanted something more reflective of the US in size and displacement or not. Now if Japan did a 180 and made it possible to get a 6 cylinder block where they have 4+turbo and stop limiting 8 cylinders to trucks/higher-tier cars, perhaps there might be some redeeming value to them. They managed to do this in the 1980's, but got too concerned about being green. Their immediate competitors would be Textron, a maker of golfcarts. That is, if you don't count a certain ex-British car company that got passed from one colony to another. juandos: "if the one time American company now based in Bermuda, it might not have that expensive and excessive government regulations to deal with ..."
Bermuda might provide relief from some taxation of non-U.S. subsidiaries. But the u.S. operations of a bermudan company will be subject to the same crippling U.S. labor and environmental laws. Those U.S. operations will still pay the same local, state, and federal taxes regardless of where hdq is located. There's really not much difference. Yes, but didn't the japanesw also cut into US market share, thereby scarfing up some jobs formerly held by people building american cars? The change in japanese jobs is another issue. First, reread my sentence that you quoted carefully, and you will realize that your response was entirely unnecessary. Second, you are arguing two different things. You start by assuming that only a certain number of cars are sold each year, which may be correct to assume, and that a new competitor springs up out of thin air in the US, taking jobs from existing domestic auto workers which is not the case. Then you argue that no matter where the additional new cars are built, they will cost existing domestic jobs, and this is correct. Globally, there will be some jobs lost and some new jobs created. However - we are talking about whether those new jobs will be created in the US or Japan, not the global total of jobs. "whether the Japanese cars are made here or overseas - they bite into the existing demand for American-made cars." "it's no different than if a new American car company came into being selling a different car that then diverted buyers from existing cars." "you cannot create more demand overall by offering new/different/better products." "agree. but you are not spending MORE money overall." Is it a fixed pie, Larry? It is also not infinitely elastic. You will only sell so many cars before you saturate the market. Look around at all the homes which have three or more vehicles. I am something of an economic putz, and therefore everyone should feel welcome to take issue with what I am about to write, but... This entire way of going about analysis seems profoundly misguided to me, namely, focusing rapaciously on the *number* of jobs while performing what is essentially a standard micro analysis. If the intellectual default here is going to be classical or Austrian "good macro is just micro writ large," then the issues are going to constantly default to productivity analysis (division of labour, comparative advantage, etc.) Obviously Larry G is doing a more Neo-/Keynesian macro with his concern about aggregate demand, but otherwise I simply fail to grasp the merit of focusing on job numbers, rather than productivity -- the fundamental driver of "compensation" in the most extended of senses. Is everyone so concerned about the current level of underemployment as to abandon talk of micro-fundamentals? Creating jobs *qua* jobs is no difficult thing: We can simply return to the days of yore when everyone was down on the farm and unemployment was far below even our current "natural rate." Correct. You can create some more demand by offering new/different/better products, but it is not a sure thing, remember New Coke? Besides, first your customers have to have some money, and then they have to have a perceived need. That guy with three cars in the drive probably isn't getting a new one until another one gets destroyed. If you have all that in place and then come out with something good, it might sell, but without those things in place even steve Jobs can't sell a product. Now, if most American families were taking home the same share of the national income that they were taking home 30 years ago, every family would have another $10,000 of disposable income to spend, and products would fly off the shelves. "Non-tariff barriers refers to all barriers to trade that are not tariffs. Examples of these include countervailing and anti-dumping duties, "voluntary" export restraints, subsidies which sustain in operation loss making enterprises, technical barriers to trade, and obstacles to the establishment and provision of services. " How is an "anti-dumping duty" not a tariff? How is that? I think you mistated this. First we assume for this argument though we know it isn;t true that a fixed or more or less fixed number of cars will be sold. Then a new competitor springs up out of thin air in the US, taking jobs from existing domestic auto workers which is not the case. Well of coures not, the new manufacturer still has domestic workers, so he is not takeing jobs from them. But the job location gets transferred from the old employer to the new one and the old jobs are gone. Therefore it is wrong to say the new employer created new jobs. In order to sell those cars he will have to open new showrooms, and that creates new jobs, since it takes a certain number to babysit a show room. But that gets to WBs comment about productivity. The new showroom and the old one have to split the number of cars sold, so neither one is as productive as the old one was before the interruption. Ron, how about thigs like safety standards and pollution controls? Kubota had a problem with grey market tractors being sold in the US. Ostensibly the same models, they lacked safety cut-off switches and had other parts that did not match the models for US consumption.
" Obviously Larry G is doing a more Neo-/Keynesian macro with his concern about aggregate demand, but otherwise I simply fail to grasp the merit of focusing on job numbers, rather than productivity -- the fundamental driver of "compensation" in the most extended of senses. " in terms of "new" jobs.. it's a simple metric. take one guy with $100 dollars who spends it on something. Now.. PRODUCTIVITY (OR other influence) results in him only needing $80 for the same product. he has 20 dollars extra and he buys something else - additional. but he has not spend any more than the original $100 - only split it differently. put this in a mom/pop grocery store context. he only needs $80 at Walmart instead of the $100 at mom/pop. mom/pop lose an employee because he took his money to Walmart. does the mean that Walmart added two employees? - one to replace the mom/pop job lost AND an additional new one? I'm not looking for a Keynesian, or a "neo" or any kind of "theory" answer here...just a simple common-sense explanation about the $100 and the one Mom/POP job and what happens when that $100 goes to WalMart. I don't see how that $100 goes from creating one job to 2 jobs even if productivity lowers the price of the items bought. the only way that could really happen is if the cost for the employees also got cut by 4.
so I'm not advocating any kind of economic concept..just asking a simple question....and wanting simple concise answer without a lot of rope-a-dope theory. just FYI - I AGREE on the productivity .. that provides $100 worth of goods for $80. I just don't see how that creates more jobs rather than taking away one and replacing with another. productivity actually REDUCES the need for workers - right? if the same product can get produced for 80% of what it used to then you need 20% less workforce... right? I know some guys/gals here know there stuff.. so how about putting out a simple, practical answer? "Yes, but didn't the japanesw also cut into US market share, thereby scarfing up some jobs formerly held by people building american cars? The change in japanese jobs is another issue." A Japanese car company, building a new plant and increasing production to meet increased demand, will cut into US based jobs whether that plant is built in the US, Japan, or Somalia. If the plant is built in the US, all the new jobs will be US jobs. If built in Somalia, all the new jobs created will be Somali. The number of US jobs lost is the same in any case. Think Boeing: The new plant in SC would add additional SC jobs, not reduce the # of jobs in washington. Existing SC aircraft company jobs will be lost to competition whether the new plant is built in Washington or SC. "if you assume that only a certain number of cars are sold per year then new competitors don't bring new jobs"
Let's just say that the number is static...even if that was true, these cars would be for sale in the US either way. Since these companies used to sell cars that were 100% imported, this does create US jobs....and probably another level (or 2, or 3) of management in Japan.
" A Japanese car company, building a new plant and increasing production to meet increased demand,"
where did that increased demand come from? Didn't the "new" car company intend to take some share of the existing market and then once established get his share of an expanding demand (if it expanded) or keep his share in a diminishing demand market also? on the Boeing deal... many of the new planes are REPLACING existing planes that are being retired. there may be an expanding demand for ADDITIONAL PLanes over and above the existing fleet but it could just as easily be true that the newer planes carry more people which would result in LESS planes after all existing were replaced. "It is also not infinitely elastic. You will only sell so many cars before you saturate the market. Look around at all the homes which have three or more vehicles." Do you suppose that a Japanese automaker will decide to spend billions on a new plant in the US while just hoping and keeping their fingers crossed that they will be able to sell a few of the cars they plan to make? I would think that those with 3 or more cars have them because they want them, not because they were forced to buy them by an evil auto manufacturer. There is also an attrition rate, and population growth to consider. William Bruce: "I am something of an economic putz, and therefore everyone should feel welcome to take issue with what I am about to write, but... "
Hydra: "You will only sell so many cars before you saturate the market." I don't think the U.S. automobile market will become saturated any time soon. Each year, a few million cars are scrapped. Each year, the adult population of the U.S. grows by 2 to 3 million. U.S. new vehicle sales were about 12 million in 2010. In recent months, new vehicle sales were running at a rate which would be 13.6 million annualized. William Bruce: "Is everyone so concerned about the current level of underemployment as to abandon talk of micro-fundamentals?" Although this is an economics blog, I am convinced that more than a few who comment here have never cracked open a microeconomics book. Larry G, I just want to make clear (in light of your comment) that I was not trying to pigeonhole you or shoehorn your argument into mine or anyone else's. My limited point was that you were addressing aggregate demand and its determiners, but few others were. However, the standard in this comments section seems to be a rather unapologetic "macro as micro writ large." Now, that may well be a more fruitful approach to the issues, as certain classicals and Austrians will assert, but how does one reconcile such an approach with fixations on jobs numbers, unemployment, underemployment, etc.? I earnestly try to avoid arguments on whether these should be concerns in any absolute sense, as opposed to concerns within any particular theoretical apparatus or ideological program. Obviously, my personal dipstick is productivity (and ultimately, consumption), not "jobs created or destroyed." Therefore I have no reason to address your points, since I am in a roundabout way all in favour of putting people out of work, particularly in the short-run, by doing more with less, i.e., "productivity". Now, maybe that is actually bad, say, for extreme Keynesian reasons regard liquidity traps and whatnot, but I doubt much of the commentariat would accept or welcome those arguments. Larry G: "it could just as easily be true that the newer planes carry more people which would result in LESS planes after all existing were replaced." 3. old aircraft become heavy over time with rivets on fuselage patches as material ages. "Besides, first your customers have to have some money, and then they have to have a perceived need." Money yes, but they won't likely have a need until they see the new product for the first time. Rich gadget lovers get the most expensive and poorest performing versions of any new idea. their purchases allow further development, and the product becomes cheaper and better until almost everyone has them and can't live without them. "That guy with three cars in the drive probably isn't getting a new one until another one gets destroyed." That guy will probably get a new car as soon as he sees one that he much prefers to the one that he least prefers now. Jet: "Although this is an economics blog, I am convinced that more than a few who comment here have never cracked open a microeconomics book." Thanks, Jet, You've made my day. me: "...and that a new competitor springs up out of thin air in the US, taking jobs from existing domestic auto workers which is not the case." you: "How is that? I think you mistated this." me : "...and that a new competitor springs up out of thin air in the US, taking jobs from existing domestic auto workers - but it's not the case that a new competitor springs up out of thin air." But they do have more money if more of them are working. This new production creates new demand. re: " This new production creates new demand." if you make more widgets.. people will buy more widgets even if they already have as many widgets as they want? why would they buy more widgets? How is an "anti-dumping duty" not a tariff?" producers sell in open markets and consumers are free to gain the benefits of competition from open markets. Ron, is it not ironic that the closed market of Japan for U.S. automobiles, gets to begin selling more cars in S. Korea via the U.S./S.K Free Trade Agreement? of them are working. This new production creates new demand. Nonsense. If the demand isn't there, it won't be produced, or not for long. Production does not create demand. Demand creates production. True enough that production enables some additional demand, by providing employment, but that employment will be temporary without outside demand. Outside demand depends on a healthy SYSTEM which means fair, enforceable contracts, transportation networks, and many other things that mere production does nit supply. Ron, you have not convinced me that these are 407,000 net new jobs. I don't recall seeing you on here before, but let it be known, there is only room for one economic putz here... and that, sir, is me. Please take all your 'facty' micro-econ and allow me retain my position. Thank you and Merry Christmas. Me too. Some worker that might have built our cars at Studebaker didn't. Hence not net new auto jobs. If we save money and spend it on other things, it is still not net new auto jobs. Ron, I would much prefer a nice new dump truck. I will get one when my 1983 truck is not worth repairing. Economics, not preference, drives my demand. The current model of my truck has the same weight limits, and goes no faster. It has cool stuff, like AC and iPod connector. It costs 17 times what I paid for my truck. Jet: "3. old aircraft become heavy over time with rivets on fuselage patches as material ages." I hadn't really considered that. Is it a significant weight increase? They're the ones that killed your father's job or the kinds of cars they built. "Ron, how about things like safety standards and pollution controls?" Those aren't barriers, even if government requires them. They are equivalent to features customers want, like racing tires and leather seats. Only if you measure feature count. The mass-market product is a shoddy product that might have a ton of features. That's due to Japan only knowing how to crank out glorified golfcarts or trucks turned into Third World technicals. They're afraid to build anything with any decent output in the way the US builds things - more car for less. Either way, all that irrational hate for General Motors and Chrysler's US divisions is something to leave back in the 1980's. "if the same product can get produced for 80% of what it used to then you need 20% less workforce... right?" No, you get 25% more stuff for the same amount of workforce. Bigger pie. "so I'm not advocating any kind of economic concept..just asking a simple question....and wanting simple concise answer without a lot of rope-a-dope theory." He was speaking Economese, Larry. If you're unfamiliar, here's The Shortest and Surest Way to Understand Basic Economics I know of. Also available online, complete, as HTML, and can be downloaded free from that link as a PDF file. How can you go wrong? "where did that increased demand come from?" From you and me, of course, and we love those Camrys and Accords, and buy tons of them when we replace our junky old Chev Cavaleirs. Also there are more of us each year driving and buying cars. "on the Boeing deal... many of the new planes are REPLACING existing planes that are being retired." I'll bet Boeing doesn't much care WHY airlines are buying the planes, so much as the fact that they ARE buying them. Buddy: "BTW, your inquiry on Free Trade Agreements increasing trade is correct; and not because of a large latent market slapping "Free Trade" on it. Of course markets snowball from Free Trade. AND..."
I must have forgotten the question. "Production does not create demand. Demand creates production. " Sorry, your Keynesian econ instructor steered you wrong. "Ron, you have not convinced me that these are 407,000 net new jobs." And I haven't tried to. There are 407k more jobs in the US than there would be if all those "foreign" cars were manufactured somewhere else. "Economics, not preference, drives my demand. " That IS a preference. Different people do things for different reasons to satisfy their preferences. Many are emotional.
" He was speaking Economese, Larry. If you're unfamiliar, here's The Shortest and Surest Way to Understand Basic Economics I know of. Also available online, complete, as HTML, and can be downloaded free from that link as a PDF file. How can you go wrong? " well you shouldn't need a book to know that producing more of something when there is no additional demand for it won't create additional demand. it's akin to believing people will buy more milk than they need, simply because more of it is produced. reading to a book won't change these realities but they may assuage those who need to believe economic fair tales. Ron H: "Is it a significant weight increase?" According to the engineers at my company who estimate fuel burn caused by such weight additions, yes it is significant. Understand that they're referring to aircraft 25 years old, which develop small cracks due to metal fatigue. Every extra pound of metal is an extra pound of human that cannot be hauled, and revenue is booked from hauling people an agreed amount of distance in an agreed amount of time. Airlines haul a lot of pounds a long way, so weight savings would be exponential. Do airlines have a metric of revenue and cost per-pound, per-mile, per-hour? I never could figure out why I have to pay the same amount of money as someone who weighs twice as much as me to fly in the same class on an airplane (assuming the person can fit in a single seat). Nothing else we ship ignores weight (including luggage now). Walt G: "I never could figure out why I have to pay the same amount of money as someone who weighs twice as much as me to fly in the same class on an airplane (assuming the person can fit in a single seat)." 3. because we live in a stupid world where fat people are excused their excesses by a bleeding-heart, indoctrinated public. Larry G: "well you shouldn't need a book to know that producing more of something when there is no additional demand for it won't create additional demand." Well, Larry, that statement pretty much demonstrates that you eaither have not studied economics or else the subject didn't interest you enough to pay attention. So why do you waste your time and ours by commenting on an economics blog? Walt G: "Do airlines have a metric of revenue and cost per-pound, per-mile, per-hour?" I've never seen a revenue/pound metric for passengers, but it's a key statistic for cargo. I think all airlines measure and react to the others. Cost per pound is probably the most important of those metrics. Cost per pound varies significantly for each aircraft and engine configuration. As fuel costs have increased, engineers have made incremental gains in aircraft and engine efficiency. Your explanation of supply and demand makes sense. It's also why an airline could give an empty seat on an airplane ready to take off to a passenger for $1 and have $1 of profit to show for it (minus the added fuel expense only for the extra weight and any peanuts given away). It would be a very interesting test in pricing discrimination if a law were passed that passengers had to wear tags for how much they paid for their flight on their shirts. I would imagine that pricing discrimination only works if the actual price paid is not readily transparent. You mean he has not studied economic theory, which may have nothing to do with the real world. I know that I do not feel compelled to run out and buy every new gadget, and no amount of innovation will get me to buy omething that I do not need or cannot afford. Therefore, in at least two cses (me and apparently Larry) it is NOT true that innovation/production leads to demand. There were LOTS of dotcom start ups that were innovative and productive, but which did not stimulate enough demand to stay in business. Just because no demand was stimulated for me and larry does not mean that no demand wa stimulated, but it does mean that the theory is not universal or inevitable. The Kindle Fire generated a rash of sales, before the word got out that it is buggy. There is a case where innovation may backfire like New Coke. Attacking your opponent never advances your idea. Major carriers operate at a few cents per seat mile. Figure 180 lb average passenger weight, and you have your answer. Some airlines do charge more for heavy passengers, and some airlines do weigh their passengers before take-off. These are usually airlines that fly weight critical smaller planes. Weight carried is a part of airline costs, but not the major one. Airlines just figure an average passenger weight and set their minimum price accordingly, letting the skinny and small subsidize the large and obese, but it is incorrect to say that weight is not part of the costing orpricing exercize. hydra: "Just because no demand was stimulated for me and larry does not mean that no demand wa stimulated, but it does mean that the theory is not universal or inevitable." I'm not sure you and I have the same understanding of the law of demand, hydra. Did someone actually teach you that economic theory says a reduction in price will increase demand for every consumer? If that's what you were taught, hydra, then perhaps you might benefit by re-learning some of the basic concepts of economics. Here's a link to a very simple explanation of The Law of Demand. If you read the simple explanation of the Law of Demand, you will not find any statement that an increase in price results in an increase in demand for every single consumer.
" You mean he has not studied economic theory, which may have nothing to do with the real world." I know the theory and I know what's in the books but I also have a brain and can see that if someone has enough milk that they're not going to buy more because someone decided they were make more. I understand that you cannot look at supply / demand in total isolation... but I also understand that producing more of something that is already supplied in the market will not create an increased demand for it either. you can build all the brand new buggy whip plants you want but no one is going to buy them. you can build all the new Oldsmobile plants you want also but it won't cause more Oldsmobile sales. there has to be demand for what is being supplied and if the market is saturated for a particular item you're not increasing demand by providing more of it. this is simple common sense and you should not need a book to help you understand it. but I note that folks who fervently believe in supply-side economics tend to also believe that if you put up a new manufacturing plant and employ people that you'll create new/additional demand.. even if the customers have plenty of the item and no more money to buy more anyhow. why is this important in the context of this and other [blank] creates new jobs..threads? because when we say that some new plant or extraction activity "creates" new jobs - it's important to understand if they are merely competing for the existing demand ... and taking their piece of it through competition or whether there is actually new, additional demand. when people buy new Toyotas... they're NOT buying Chevrolets. So the "new" Toyota job is gained at the expense of the Chevrolet job. Indeed as Toyota sales have ramped up... they've come at the expense of Chevrolet sales. People are not buying new Toyotas as well as Chevrolets...so that the Toyota job is a net new one - unless overall demand for cars - the aggregate demand for cars itself is going up. then...BOTH Toyota AND Chevrolet would be competing for the new demand and the new jobs that would come from meeting the additional new demand. hydra: "Some airlines do charge more for heavy passengers, and some airlines do weigh their passengers before take-off." Perhaps. I have no experience with practices of tiny commuter airlines. I assumed Walt G's question was about practices of jet passenger airlines. That's the industry I've worked in for decades, and I think that's why he asked me. hydra: "it is incorrect to say that weight is not part of the costing orpricing exercize." I don't think anyone said that passenger airlines do not factor passenger weights into their cost analyses. I can confidently say that individual passenger weights are not a factor in pricing jet passenger airline tickets. Note that I said weights, not passenger size. My preference is to believe you are an idiot. Nothing the manufacturors have done has creatied any demand on my part. Therefore it is not always true that production stimulates demand. Demand comes from CUSTOMERS, not from producers. For that demand to happen they will have to prefer your product (and the payment for it) to what they already have and paid for. Otherwise, you can produce until you are blue in the face. re: " Here's a link to a very simple explanation of The Law of Demand. " this kind of demand that the link talks about is if prices go down..demand goes up. but people are not going to buy more milk and later dump it out just before the price goes down. and they're not going to buy new Toyotas in addition to their current car because Toyota's are cheaper/better, etc. they'are going to buy ONE car, not two no matter how cheap the new ones are. they'll used the saved money for something else ... I agree but building more auto plants is not going to result in more auto sales.
" In macroeconomics, aggregate demand (AD) is the total demand for final goods and services in the economy (Y) at a given time and price level. It is the amount of goods and services in the economy that will be purchased at all possible price levels. This is the demand for the gross domestic product of a country when inventory levels are static. It is often called effective demand,"
if you are a dairy and not all of your milk is selling and you have to dump it and lowering your prices won't get you more market and/or is below the your cost to produce it - then you lower your production. if you RAISED your production.. you'd be dumping out even more milk and going broke quicker. it gets a bit more complicated when a new kind of something if offered - like an IPHONE and people without any phone at all are convinced to buy it but those same people are not creating "new" money to buy the phone - they are switching their money away from something else they spend it on so if they're not making more money - they're making tradeoffs on what they buy. Perhaps they were eating out 3 times a week and the cost of the IPHONE caused them to only eat out twice a week. the IPHONE did not "create" "new" aggregate demand.. it just cannibalized existing static demand. if they make MORE money then YES..they will now treat themselves to the IPHONE without making other sacrifices. but if the product is milk - no matter how many pay raises they get or how much more milk is produced..they're not going to buy more. you cannot convince people to buy more milk if they don't need more even if you cut the price in half or even gave it away. If the supply of milk in the U.S. increases so much that dairy farmers cannot sell at current prices, they will lower prices. When the price gets low enough, consumers - both households and food processors - will find other uses for milk. Some households will feed it to their pets. Some may even bathe in the stuff. Some food manufacturers will begin to use milk rather than other forms of fat in their recipes. The demand for automobiles cannot be described as "saturated" unless one specifies a price. If a manufacturer can produce cars for one half current cost, households and businesses will buy more cars. If the price is low enough, some households would buy an SUV and a pickup, for example, rather than opt for a single vehicle. Some car buyers who considered a used vehicle would now consider the lower priced new car. Again, if you do not understand the Law of Demand, please read the passage at the link I provided. I have no idea whose arguments you guys are responding to, or what you are trying to argue. But I'm pretty sure it is not worth my time to continue this discussion. re: " I can confidently say that individual passenger weights are not a factor in pricing jet passenger airline tickets. Note that I said weights, not passenger size. " then why are they now charging for bags? at some point lowering the price does nothing to affect demand and will cause the producer to go broke. there is a price point below which you won't sell more for a LOT of products. it's like stepping up to 7-11 and finding that Big Gulps are a dime... and what are you going to do - buy a case and put them in your trunk? you are not going to buy 10 sofas because they are 1/2 price. you're not going to buy 10 big screen TVs because they're 1/10th what they used to cost. the only way a new TV factory survives is if they take a share of the existing demand and that comes at the expense of one or more of their competitors. this is why Oldsmobile goes belly up while Camry's increase sales. How do you know that? I thought the explicit reason for the new plant was to move jobs. From you and me, of course, and we love those Camrys and Accords, and buy tons of them when we replace our junky old Chev Cavaliers. Also there are more of us each year driving and buying cars. Given that all of those cars are lower-end 4 cylinder vehicles, you're making a lateral move as opposed to a vertical one. It also proves that General Motors (and like-minded Chrysler) do better at providing more car and engine per dollar than Ford or any of the other transplants. Remove the environmental fetters on GM and Chrysler, and let them make the affordable large cars they havent made since the mid-to-late 1990's. If GM was smart, they'd have just kept them for the US market, dropped Buick, and let China have all the shoddy Opels it wants. Instead, we get a ton of relabeled & depowered Opels that vaguely look like BMW's own stock. You get worse-off cars like the Camrys that are even less American than the Oldsmobiles are, and more like something you would find in some Third World backwater. I think you're missing the point. This isn't always about buying a ridiculous number of things you don't need. It's often about encouraging people to buy a little more, or make a replacement purchase more often. Both are new demand based on price and I'm sure you do it all the time. "they're going to buy ONE car, not two no matter how cheap the new ones are." It depends on space and where price intersects with desire. If another car, or an additional car at another location is something you want, you'd buy it when the price becomes right for you. "you are not going to buy 10 sofas because they are 1/2 price." Maybe not, but you may buy one when you weren't going to buy any. "you're not going to buy 10 big screen TVs because they're 1/10th what they used to cost." "I think you're missing the point. This isn't always about buying a ridiculous number of things you don't need. It's often about encouraging people to buy a little more, or make a replacement purchase more often. Both are new demand based on price and I'm sure you do it all the time." but the basic premise that increased supply begets increased demand is simply not true most of the time. It depends on space and where price intersects with desire. If another car, or an additional car at another location is something you want, you'd buy it when the price becomes right for you." Maybe not, but you may buy one when you weren't going to buy any." yes.. I agree..but the money you spend on that new sofa is money you did not spend on something else (assuming you did not get a pay increase). whatever you spent your money on before.. you stopped spending it on and now divert it to the sofa. the only way you're going to spend ADDITIONAL money is if you have ADDITIONAL money. otherwise your "demand" is the same...just for different things. I just think the idea that demand can be stimulated by more production is wrong-headed. And if the theory is that way and someone does really understand the theory (as opposed to blindly believing it) - they should be able to explain it in practical real-life examples... of which I have heard - none. I'm giving real world examples that seem to disprove it.. so I'm asking for others who believe the theory to give real-world examples where MOST people are going to buy MORE because MORE is produced....even if their income is the same. over and over - we see in this blog threads that proclaim "new jobs".. but I'm suspecting in many cases - these are not new but replacement jobs. I have a little free time, so I'll respond after all. Larry: "then why are they now charging for bags?" I was referring to not charging for the weight of the passenger, not the weight of his luggage. The legacy airlines do not charge $25 a bag in order to recover the fuel burn cost. The fuel cost to carry a 30 pound bag is not that high. Legacy carriers separated passenger fares from baggage fares for a simple reason: they can appear to offer fares as low as Southwest Airlines without actually doing so. Larry G: "the basic premise that increased supply begets increased demand is simply not true most of the time." When increased supply leads to lower prices, the lower prices almost always result in increased purchases. The increased demand at the lower price was always there. For all but a very tiny number of products, demand curves are downward sloping. Researchers have been trying without success to find exceptions to this law for decades. Larry G: "I'm giving real world examples that seem to disprove it.."
I don't think so. You are offerring your interpretation of the behavior of consumers, and calling it proof. As I said earlier, researchers have tried unsuccessfully to find products which did not have downward sloping demand curves.
" I have a little free time, so I'll respond after all"
geeze Jet.. how about your own situation? are you going to buy more cars than you can afford just because they lowered the price? or ground beef or gasoline? maybe you'd go buy a 30 cu ft freezer or a 300 gallon fuel tank but MOST people do not. people do not build new plants on hopes that by manufacturing more of something that demand for it will increase...it makes no sense. History is full of examples of supply creating demand. The first automobiles were too expensive for all but the wealthy to own. Then Henry Ford found a way to drastically lower production costs through specialization and, most importantly, economies of scale. Only by producing hundreds of thousands of automobiles was he able to make them affordable to the masses. The first large screen televisions were much too expensive for the typical American household. But mass producers found ways to drive down the costs, and now millions of large screen televisions are sold. Crawfish used to be an expensive food item when they were harvested in the wild. Today crawfish farms produce billions of the little mudbugs, and frozen crawfish tails are available in supermarkets all over the U.S. I could provide hundreds of examples where increased supply resulted in hundred-fold increases of purchases. Why is that idea so difficult to grasp? Larry G: "people do not build new plants on hopes that by manufacturing more of something that demand for it will increase...it makes no sense." Sorry, but I think you are mistaken. Entrepreneurs have been using market research to forecast demand, and then building plants based on that research. That happens all the time. How do you think the first automated plant in any industry got built? unless the buyer had an increased supply of money or spent savings. but once you buy that Model T.. you're not going to buy a 2nd, 3rd, 4th one just because there's a ton of new manufacturing plants spewing them out.. even if they are cheaper. people will buy DIFFERENT products by switching their money from other purchases. that's not increased demand... that's just diverted demand. if you buy a car but have car payment..then the money is diverted from where you spent it prior (or saved it).
" Sorry, but I think you are mistaken. Entrepreneurs have been using market research to forecast demand, and then building plants based on that research. That happens all the time. How do you think the first automated plant in any industry got built? " there are two kinds of demand. there is the existing demand and there is new demand from population growth ... increases in income, etc. If a plant is built to sell an existing product - they are then competing for the same demand and will (if they outcompete) takes sales away from their competitors. that's just carving up the existing pie. "new" demand - like from population growth is real but a new plant won't cause it ...won't "create' it.. they just try to capture their share of it. people will not buy more salt and pepper no matter how many new plants produce it even if the price goes to zero. no one (well almost no one) is going to buy new salt and pepper every two days because there is an over-production of it. Larry G: "If a plant is built to sell an existing product - they are then competing for the same demand and will (if they outcompete) takes sales away from their competitors." As I said before, the demand was always there. That is, the demand for fast personal transportation. But the price prevented consumers from purchasing the product. When Henry Ford found a way to lower prices, the demand for cars was unleashed and sales soared. When Henry Ford built his assembly line factory, he did take some sales from existing manufacturers. But he greatly expanded the market, and millions more households owned cars within a few years. What happened next is that some of his competitors quickly learned how to compete with Ford, and they also realized increased sales. This is pretty simple stuff, Larry. That you continue to argue against the Law of Demand is what makes continued discussion pointless. If you want to dispute basic economic concepts, go ahead. But it's really a waste of time. "well you shouldn't need a book to know that producing more of something when there is no additional demand for it won't create additional demand." If you had read the book I recommended, or almost any economics book, for that matter, you wouldn't make the above comment. "reading to a book won't change these realities but they may assuage those who need to believe economic fair tales." And, that attitude prevents you from understanding WHY you wouldn't have made the above comment. book learning is good but if you can't explain the theory you cite in practical terms then you haven't learned. we don't increase the sales of salt and pepper by building more salt&pepper plants. tell me why the above is false. show me in practical terms how that fits the "theory" and the "books" you read. don't cite your books.. explain the issue in practical terms. Jet: "2. because weighing passengers before boarding would make air travel even more time-consuming and inconvenient, reducing demand;"
Again, we seem to be in the position that I'm not sure what you're arguing. Is it lower prices don't spur demand, or that lower prices don't make any difference because they only draw people away from other products? Both would be wrong (especially if one is lucky enough to need/want 2 separate products that have both undergone price reductions), but I understand why you'd say the latter. Count your computers and compare that number to the one you had 20 years ago. Now, let us know what you gave up for the house full of computers that you didn't really need. I'd guess that you didn't give up anything but an insignificant number that might be in your savings account....more than likely, you gave up something you no longer need...like stamps. "we don't increase the sales of salt and pepper by building more salt&pepper plants." Uh, ya, we do. Salt used to be an incredibly expensive commodity, now it's free at the drive through.
" Again, we seem to be in the position that I'm not sure what you're arguing. Is it lower prices don't spur demand, or that lower prices don't make any difference because they only draw people away from other products?" it's that producing more of a product will not increase demand for it even if the price is lower. people will not buy more salt/pepper even if there is increased production of it and even if the price plummets. at some point.. people might stock up but then they quit. "Both would be wrong (especially if one is lucky enough to need/want 2 separate products that have both undergone price reductions), but I understand why you'd say the latter. Count your computers and compare that number to the one you had 20 years ago. Now, let us know what you gave up for the house full of computers that you didn't really need. I'd guess that you didn't give up anything but an insignificant number that might be in your savings account....more than likely, you gave up something you no longer need...like stamps." but you won't buy more of something you already have and don't need more of no matter how many new manufacturing plants are built to supply it. so it's the basic idea that demand can be "created" merely by adding production that I question. there has to be a viable demand for something before you can increase production and sell more of it. if the basic theory held.. you could open up any kind of manufacturing plant and just the fact that you were manufacturing more widgets would 'in theory' increase demand for the widgets. companies go out of business all the time because they produce something for which there is no demand...or insufficient demand. or other companies produce the same item for less money or better functionality/quality and put their competitor out of business. but that's not a NEW JOB. It's an existing job that went from the company that went under to the company that made that other company go under. I know it gets more complicated that this simple example but people are not going to buy more salt/pepper just because more salt/pepper plants are opened. for the economic "theory" in the books to make sense.. I need to understand why opening up more salt/pepper plants does not result in more jobs at the plants because the increased supply of salt/pepper has generated ...more demand. it seems totally bass ackwards.
" Uh, ya, we do. Salt used to be an incredibly expensive commodity, now it's free at the drive through"
you're not eating MORE SALT because MORE OF IT is produced. you're just buying it at different places that offsets your consumption at home for meals that you eat out. are you saying that people are going to buy more salt than they can eat and store it in a closet because more and more of it is produced and it is cheap? "you're not eating MORE SALT because MORE OF IT is produced." Yes. We do. By far. Salt used to be unattainable. Now everybody has loads of it. Everybody. Extremely poor people have a giant box in their home. "are you saying that people are going to buy more salt than they can eat and store it in a closet because more and more of it is produced and it is cheap?" Yes, and it's called a pantry...basically a closet, but that's the term most people use. "Uh, ya, we do. Salt used to be an incredibly expensive commodity, now it's free at the drive through"
Mike - how many containers of salt do you have in your pantry and do you buy more of it because more of it is produced? do you have a ton of it in storage somewhere or do you (like most folks) have one or two containers that you replace when you need it (rather than when production ramps up)? There is no reason to take this to an extreme unless you're trying to confuse the issue. You brought up a great example. Most people couldn't have salt before the mass production we see today. Most people had NONE. Now, everybody has more than they can use in a month on hand. We don't need a ton of salt in a warehouse when I can pop in the store and buy more than I need for the same amount of money I could find in the street on the way there. What used to be reserved for the well-to-do is now so common that it is almost free. If you wanted, you could walk to the condiments at McDonalds and put enough in your bag for a week without anybody saying a thing.
" There is no reason to take this to an extreme unless ...."
but it's not the extreme Mike. Look at the stuff in your house. do you have 5 years supply of anything in your pantry? do you have 20 TVs stored in a closet ? do you have 10 cars in the driveway? it don't matter how many more factories are built..it won't cause you to buy more of what you already have enough of. the theory cannot be reconciled with these common sense examples. "Nothing the manufacturors have done has creatied any demand on my part. Therefore it is not always true that production stimulates demand." You must have missed Jet Beagle's helpful comment and great link that explains the concept of demand. No one cares about your personal demand curve, or about any of your own personal experiences, for that matter, as most of them are extreme outliers.
" You must have missed Jet Beagle's helpful comment and great link that explains the concept of demand. No one cares about your personal demand curve, or about any of your own personal experiences, for that matter, as most of them are extreme outliers. " nope..nor did I miss your idiotic comment... you must put your head up your other end sometimes for giggles and grins, eh? Sexton, Robert; Fortura, Peter (2005). Exploring Economics. ISBN 0-17-641482-7"
See? Even Larry thinks your individual demand is irrelevent. That's not common sense, it's silliness. There is absolutely no reason for anyone to stockpile those products as they are readily available. That doesn't mean we don't consume tons more than we used to. And, using salt as the example, a product with less necessity...we don't need to preserve our own food the way we used to. Perhaps you can take a second to explain to me why we have so much more consumer demand for salt, everybody has it, and it's extremely cheap - if not for increased production and supply. You can't. Have a good weekend. and lay off the salt! No way! I'm going for margaritas in 3...2...1... (salt included!). "How do you know that? I thought the explicit reason for the new plant was to move jobs." You thought wrong. There are plenty of news sources if you're interested in the subject. The decision was whether to build a new plant in Washington or SC, and SC won out. I have no idea whose arguments you guys are responding to, or what you are trying to argue. But I'm pretty sure it is not worth my time to continue this discussion." I could probably learn something from your example. "Given that all of those cars are lower-end 4 cylinder vehicles, you're making a lateral move as opposed to a vertical one." If you had any clue, you would be dangerous. Are you not aware that Camrys and Accords come with V6 engines and many upscale options and features? No of course you don't. Such knowledge would interfere with your meaningless drivel. Yet it's like pulling teeth to get them at Detroit-level prices. Where Detroit offers a 6, Japan offers only a paltry 4 with a turbo. Where Detroit offers an unfettered 8, Japan restricts you to a truck, exotic, or GPS-restricted V6. Where Detroit offers an I4, it's because some environmentalist was empowered to force them to offer one. Ok, so today I had to buy a headlight bulb for my car. The bulb cost $150. And I will likely have to remove the front bumper to install it. In the bad old days of regulated, standard, round headlights, I could get one for $8. Is this the innovation that drives demand? And that is just the bulb. Now that every car has custom designed light housings a full replacement t is easily $500. But, what the heck, it increases demand. Do you have fen cars in the drive? Two cars and four trucks. I expect them to work, and to be repairable when they don't. Individual demand is not irrelevant. It is unlikely but not impossible that aggregate demand and individual demand correspond, but not impossible. The fact that many start ups fail provides the proof. Some times it works some times it doesn't. If the software wasn't buggy to begin with.. Does not make the theory a law. "Armchair Economist: Economics and Everyday Experience." You clowns could learn a lot by ignoring your theories and looking out the window once in a while. None of this has convinced me that the 407,000 jobs are net jobs. is offset by the reduction in auto mechanics that you used to spend that money on. That is what I thought, until I encountered the $150 headlight bulb that costs $200 to have installed, because it cannot be done in your driveway eith common tools. Sometimes it works, sometimes it doesn't. In the science worrld it only takes one exception to trash the "law". What you have is a theory that describes events that are only sometimes true. In my world, that is enough to trash the theory. However that does not mean that the model is not sometimes, or even generally useful. it is just not the absolute you believe it to be. Larry is right. I bought my dumpt truck in 1984. Now matter how many they built since then, no matter how much better, and no matter how many raises i have had since then, they have not increadsed MY demand for a dump truck: I already have one. That does not mean that dump trucks are not sold, or that there is not some new demand, but building new dump trucls does NOT cause the demand. You are trying to win the argument by introducing a new variable: the fact taht the cars being manufactured her enow were previously imported. Take out the time difference and anser the question: are these 407,000 new jobs net new jobs, or are some of them at the expense of other car jobs, when those cars are no longer sold? The decision was whether to build a new plant in Washington or SC, and SC won out. I stand corrected, i thought it was an existing pant in washington or a new one in SC. Does not chnage the argument on this string, are the 407,000 jobs net new jobs or not? Nothing here has convinced me they are net new jobs. I am in a roundabout way all in favour of putting people out of work, particularly in the short-run, by doing more with less, i.e., "productivity". Meaning fewwer and fewer people will earn more and more as they corner the market on productivity? What do we do with the people who are out of work? Even Larry thinks your individual demand is irrelevent. It is irrelevant to whether goods are sold. As pointed out demand increases with available money to spend and it increases with population, among other things. But individual demand is not irrelevant when arguing whether increased production increases demand. All it takes is one example to prove that idea false. That does not mean that your theory is not a useful model for how the economy works in the aggreagate. Water does not ordinarily dissociate into hydrogen and oxygen, and we work very well on the assumption that it never happens, but it would be wrong to say that water is always water, and we have a more accurate model by recognizing the facts. Each year, a few million cars are scrapped. Each year, the adult population of the U.S. grows by 2 to 3 million. What has that got to do with production causing demand? I already said those cars would be replaced once they were destroyed. You are attempting to change the argument. Did someone actually teach you that economic theory says a reduction in price will increase demand for every consumer? Yes. And they taught me that it was a theory, or a model of how the economy works, they did not teach that it is an immutable law. What has that got to do with additional production creating demand? then perhaps you might benefit by re-learning some of the basic concepts of economics. Why would I benefit from re learning concepts of economics that I have observed not to apply in the real world? I am a scientist, I take theories and test them. I do not simply accept them like some economics drone. So the demand existed before the plant, and the forecast was for the increase in future demand. It has nothing to do with demand being CAUSED BY THE PRODUCTION. you will not find any statement that an increase in price results in an increase in demand for every single consumer. I never claimed it did. Try to stay on topic instead of putting words in my mouth. Simple question, are the 407,000 jobs net new jobs or did some of them come at the expense of other auto jobs that expired under the weight of competition? That doesn't mean we don't consume tons more than we used to. We do, collectively. But none of us consume more solely because more is produced and more is available. when people WHO USED TO BUY CHEVROLETS buy new Toyotas... they're NOT buying Chevrolets. So the "new" Toyota job is gained at the expense of the Chevrolet job. Otherwise, the additional plant capacity might be absorbed by new consumers and therfore be credited with creating new demand. In fact, the parents of those new consumers should be credited with creating that portion of the demand. Demand wich otherwise would have been met by chevrolet, and perhaps without a new plant, but whichin any case was NOT created by the new toyota plant. I can confidently say that individual passenger weights are not a factor in pricing jet passenger airline tickets. Not anymore, but at one time airlines did weigh passengers. Individual passenger weights are not considered, because average weights will do, when carrying 200 passengers. But individual weights ARE considered in calculating the average because the average used has increased over the years, as individual weights increased. There was a famous case in which a plan was carrying coin collectors to a conference or show. They preferred to carry their best coins on their person. The weight of all those extra coins very nearly crashed the plane as it needed extra runway to get off the ground. JB, you are changeing the argument by denying his preface. The prefave of saturated market is used ONLY to make a point that at least some of those 407,000 jobs come at the cost of other automotive jobs. Your dairy example is stupid. The dairy manufacturers will not lower the price of milk enough to bathe in, they will go out of business. Auto manufacurers will not lower their prices enough to use thm as golf carts: they will go out of business. Because there is not enough demand for the product they make, which is milk, not bathwater. For the purpose of larry's argument, his premise is a sufficient but not a necessary condition to prove his point. There is no reason to take this to an extreme unless you're trying to confuse the issue. But we are not talking about something new. We are talking about more or less interchangeable camrys and tauruses and sentras and whatever piece of junk chevy makes or used to make. Besides the first part about the milk tels the story, If you can't sell it, youstop production. You do NOT increas production to create demand. No one cares about your personal demand curve, or about any of your own personal experiences, for that matter, as most of them are extreme outliers. I think those idiots that do not care are missing a big niche market. I stopped buying from sears when they stopped taking the slogan we service what we sell seriously. You see where that got them? But he greatly expanded the market, and millions more households owned cars within a few years. You give him too much credit. the market greatly expanded, and he took advantage of it. But he did not create the demand for travel that does not involve walking. I know the therory, but theory cannot be reconciled with common sense. Since no one will take on the issue of whether the 407,00 jobs are net new jobs, lets talk about what this is really about. It is about the (clearly faulty) argument that the "job creators" are responsible for creating the economy and jobs, and government is responsible for destroying that economy, especially the Obama government. If the middle class had the same percentage of the total income as they had 38 years ago, every family would have $10k in additional disposable income to spend today. Now THAT would increase demand. And by george, some job creator would be forced to build a plant to meet that demand. You can get a kitten for nothing. The supply is near infinite. Why has thus not created more demand for kittens? Why don't we ea them, since they are cheaper than rabbit? Or skin them for fur? You think production of perdue cat meat would stimulate demand? Seth, you missed out on the v6 accord hybrid. It was a real rocketship. "Meaning fewwer and fewer people will earn more and more as they corner the market on productivity? What do we do with the people who are out of work?" If you understood economics and history you wouldn't ask that question. Productivity has increased, over time, since the start of the industrial revolution. Where are all the unemployed people you are worried about? Please don't be so disingenuous as to mention the current recession and unemployment rate. "There was a famous case in which a plan was carrying coin collectors to a conference or show. They preferred to carry their best coins on their person. The weight of all those extra coins very nearly crashed the plane as it needed extra runway to get off the ground." You must be the most gullible person in the world. How many coin collectors do you think are likely to be on any one flight? How much weight do you think each would comfortably carry on their person? Do some math, or better yet, ask some one to do it for you, as I recall you have a lot of trouble with math. Would it make a difference if they checked their coins as baggage? Think about it. 100 coin collectors carrying 10lb each would add 1000lb to the weight of the plane. Don't you think commercial flights have a wider margin of safety than that? Ask Jet Beagle about it. "Besides the first part about the milk tels the story, If you can't sell it, youstop production. You do NOT increas production to create demand." For a farmer, you seem to have little knowledge of cows. The only way to stop production is to sell or kill the cows. Oh, that's right, you're a scientist today. "But individual demand is not irrelevant when arguing whether increased production increases demand. All it takes is one example to prove that idea false." Do you mean because you haven't bought a new truck? "Why would I benefit from re learning concepts of economics that I have observed not to apply in the real world?" " For a farmer, you seem to have little knowledge of cows. The only way to stop production is to sell or kill the cows." indeed that's actually how a diary herd is downsized. going in the other direction... farmers do not open new dairies on the premise that if they do more demand for milk will result. they especially don't do this when demand is already more than satisfied and the price has dropped to nearly what it costs to produce the milk. if all we really needed to do to lower unemployment was to open more factories - and the resulting demand would increase in response (per the theory), to the new factories then why do we not do exactly that? that's because supply side theories are nutty as a fruitcake when it comes to REAL economys. Furthermore, dairy is a really bad example. You cannot simply go into the dairy business anywhere, the dairy business needs infrastructure, provided by other businesses: it takes an entire system for any of it to work, once you go below a minimum production level, an entire area will shut down, and all the dairy related businesses fold. At that point, no matter what the demand, it is hard to re-start dairying in that area. If the baggage were checked it would have been weighed. Anyway, it is an actual story, though old. And remember, it is not only a question of weight but of distribution, planes have been wrecked by having too much weight too far aft, even though the plane was not overloaded. Where are all the unemployed people you are worried about? God forbid we should let current events change history. What about all the people who have jobs that produce nothing? The people who are marginally employed? WB said he was in favor of putting people out of work through more productivity. I just asked where that leads us. One possibility is that necessities are produced by fewer and fewer people, forcing more and more people to do less necessary work at give away prices in order to stay in business. Hard to see how a lot of people doing scut work for low wages advances us much. globally, that is pretty much where we are. No one benefits from applying theories that are false, or from mis-applying theories that are true. At best your argument is circular, and there is no way to argue that the circle starts "here": that production causes demand. Production requires employment and employment enables demand, which requires production. But people will have some demands, with or without employments, so you simply cannot start production without some kind of demand as an incentive. So you could just as well say that demand requires production and production requires employment and employment enables demand. Still no cogent response as to whether the 407,000 are net new jobs. "If the baggage were checked it would have been weighed. Anyway, it is an actual story, though old." In that case maybe you can find a reference to it, as I can't. Actual story doesn't equal actual event. "And remember, it is not only a question of weight but of distribution, planes have been wrecked by having too much weight too far aft, even though the plane was not overloaded." Must I assume that all the coin collectors crowded into the rear restroom during takeoff, or at least sat as far aft as they could? Don't you need to include that in the original story? I'm not wiggling, just pointing out an additioanal factor. I was in fact a real event, which you can look up if you choose. Still no takers on the 407,000 jobs question. Even without proof, does ANYONE here believe all those jobs are net new jobs? No theories or rationalization needed, just an opinion, yes or no. "God forbid we should let current events change history." I only asked that you consider the question as of 2007. Surely even you won't suggest that productivity gains since then have caused massive unemployment. Since the beginning of the Industrial Revolution productivity gains have raised the standard of living of billions of people, while population has increased dramatically. Robert Lucas Jr.: "For the first time in history, the living standards of the masses of ordinary people have begun to undergo sustained growth ... Nothing remotely like this economic behavior has happened before". It seems that increased productivity is a GOOD thing, but all you and your fixed-pie buddy Larry can focus on is the fact that some jobs were lost along the way. Surely you understand that Ford's assembly line caused an increase, not decrease, in the number of auto workers. I would recommend Schumpeter on creative destruction for a better understanding of this phenomenon, but you have made it clear that it would be a waste of my time. "Books? We don't need no stinkin' books!" " What about all the people who have jobs that produce nothing? The people who are marginally employed?" Other than government workers, anyone who works and gets paid for it is producing more than they are paid, or they won't long be employed. Please don't use a personal anecdote in response.
" It seems that increased productivity is a GOOD thing, but all you and your fixed-pie buddy Larry can focus on is the fact that some jobs were lost along the way. Surely you understand that Ford's assembly line caused an increase, not decrease, in the number of auto workers. " indeed. but you won't create demand b opening up a Ford plant of any size - believing that no matter the size - it will generate the necessary demand to employ workers. ditto... solar panel plants.. (Ron ought to like that one). "At best your argument is circular, and there is no way to argue that the circle starts "here": that production causes demand." Nor can you say that demand causes production, I guess. "I'm not wiggling, just pointing out an additioanal factor. I was in fact a real event, which you can look up if you choose." As I said, I did look it up and can't find anything. Since it's your claim. how about citing a reference. Furthermore, dairy is a really bad example." It was Larry's example. Do you have one you like better? Cars have been mentioned. "indeed. but you won't create demand b opening up a Ford plant of any size - believing that no matter the size - it will generate the necessary demand to employ workers." Then we must wonder why Henry did it. In your fixed-pie world he would have lost his shirt. "Still no takers on the 407,000 jobs question." Are those 407k jobs NOT net jobs? How do you know? "you may have noticed that production of things like tape cassettes has cratered and no one in their right mind believes that opening up new cassette tape plants will generate demand ...."
You keep making this nonsense argument. Step back - quit examining the bark on that tree - and get a larger view of the forest. You need a better understanding of what the discussion is about, as does your fixed-pie bark examining buddy Hydra. "You cannot simply go into the dairy business anywhere, the dairy business needs infrastructure, provided by other businesses: it takes an entire system for any of it to work... "
You are SO CLOSE! You almost got the right answer. The demand for things supplies by other businesses is created by the production, or increased production of dairy products. Rather than limiting yourself to consumer demand for milk to drink, consider the numerous other consumer products made from milk, for which a percieved future demand might cause increased production of milk. "So the demand existed before the plant, and the forecast was for the increase in future demand. It has nothing to do with demand being CAUSED BY THE PRODUCTION." Demand doesn't mean wishing. "I wish I had a new yacht." Demand includes not only the desire, but the ability to actually buy the product. Offering addition cars at lower prices is a business strategy that involves risk, and it paid off well for H. Ford. When you forecast correctly you get rich. When you forecast wrong, you go out of business, and someone with better foresight picks up the pieces. Hank's prediction that more people would buy his cars if they were cheaper was correct. That's the essence of a free enterprise system. The fact that you don't understand it is your problem.
" Then we must wonder why Henry did it"
he created something there was DEMAND for - not the other way around. and people bought Model T's ..INSTEAD of horses/wagons. you don't need to book or a theory to observe this and continuing to insist that a book or theory explains something that violates the plain facts.. is not a plus. there is such a thing as increased demand... it can come from population growth or increases in productivity but there is also such a thing as static demand - effective demand that is static - like in an economy that is not growing and has little population increase. if opening plants created demand.. there would be super easy fixes to recessions. "Production requires employment and employment enables demand, which requires production." "But people will have some demands, with or without employments..."
Demand requires the ability and desire to to pay, as well as a mere wish. "But people will have some demands, with or without employments, so you simply cannot start production without some kind of demand as an incentive." People without the means to buy things are not part of the demand. "So you could just as well say that demand requires production and production requires employment* and employment* enables demand.so you simply cannot start production without some kind of - perceived - demand as an incentive." *More accurately, the means to pay. This often results from gainful employment. Yes, with those little corrections, that's pretty much what I'm saying. "he created something there was DEMAND for - not the other way around." he created something there was *perceived* DEMAND for - not the other way around. Only the wealthy bought cars before Ford found a way to make them cheaply enough for people of modest means to buy them. Many may have "wished" they could afford a car, but without the means, there was no actual "demand". Ford's increased production at lower prices enabled much greater demand. you have to produce something for which there is a demand for. if anyone could produce any product and be guaranteed that just the act of manufacturing/providing that product/service would assure demand... we'd not need entrepreneurs... because there would be no risk in providing capital for new plants. there is a real reason why bidets are produced in much smaller numbers than toilets. it's because no matter how many bidets you produce.. the demand does not change. It's truly amazing that you can completely ignore my comments like you do, and respond with the same nonsense over and over. "if anyone could produce any product and be guaranteed that just the act of manufacturing/providing that product/service would assure demand... we'd not need entrepreneurs... because there would be no risk in providing capital for new plants." That's correct. But since that's not the case, entrepreneurs must guess that there will be demand for something, and produce some number of them to test the market. Or, someone may invent a better, cheaper whatever-it-is, produce them, and more more people will buy them. We call that higher demand. Before bidets existed, someone perceived a need for them, and produced one. There was no loud clamoring for bidets before they existed. Instead some visionary entrepreneur thought he knew of a better way for people to clean their asses, and went about implementing that better way. His vision was an accurate assessment of need, and he died rich.
" Only the wealthy bought cars before Ford found a way to make them cheaply enough for people of modest means to buy them. Many may have "wished" they could afford a car, but without the means, there was no actual "demand". Ford's increased production at lower prices enabled much greater demand. " they took the existing money they normally spent on horse and wagon and got a car. there not only was a demand for the car but an offsetting lowering of demand for horses and wagons. but this is not 'creating" demand by producing ...anything... and it's not net jobs either because the folks who were building wagons and breeding horses suffered a loss of demand when the market switched from horses/wagons to motorized wagons... and very appropriately rated in ...horse-power. the farmers who bought the Model T's had to have money to buy those model T's...or else they would not have been able to buy them. OR the farmer opened up more fields to crops in response to more demand for corn/wheat. but he would not buy another combine just because more of them were being produced. there has to be a demand... first.
" That's correct. But since that's not the case, entrepreneurs must guess that there will be demand for something, and produce some number of them to test the market. Or, someone may invent a better, cheaper whatever-it-is, produce them, and more more people will buy them. We call that higher demand. Before bidets existed, someone perceived a need for them, and produced one. There was no loud clamoring for bidets before they existed. Instead some visionary entrepreneur thought he knew of a better way for people to clean their asses, and went about implementing that better way. " in other words just building the plant did not cause the demand... the demand existed but was not recognized until some entrepreneur "thought" there MIGHT BE a demand and risked his/her money on that premise. That's a whole lot different than just throwing up a plant on the PREMISE that ANY production of anything will automatically cause a demand. and there is no demand if there is no ability to buy ......to start with. if someone is already spending every penny of their income on food, shelter, expenses... putting out a new product on the hopes that it will generate demand is loony tunes. the guy that has the fixed income... if he buys that new product... stops buying something else.. to keep his finances balanced. so the new product is not necessarily a net new job. it's a new job that replaces the other job. the only way a net new job comes about is if the consumer has an increase in his own income...often a pay raise or a better job,etc - i.e. productivity. "they took the existing money they normally spent on horse and wagon and got a car. there not only was a demand for the car but an offsetting lowering of demand for horses and wagons." from from reduced spending somewhere else. But, darn those pesky numbers, it seems that GDP has increased over time since 1908. Your claim that every auto job was offset by a loss in the horse transportation industry looks like it's bogus also. Although this table only includes data from 1661 to present, your claim that there are a fixed pie of jobs seems silly. "but this is not 'creating" demand by producing ...anything... and it's not net jobs either because the folks who were building wagons and breeding horses suffered a loss of demand when the market switched from horses/wagons to motorized wagons... and very appropriately rated in ...horse-power." You will need to explain the growth in GDP and employment since 1908 for that to be true. I can't wait to hear it. I can certainly understand why you're reluctant to read economics books! "in other words just building the plant did not cause the demand... the demand existed but was not recognized until some entrepreneur "thought" there MIGHT BE a demand and risked his/her money on that premise." You're not reading carefully, Larry. First, a definition for demand. You're not using it correctly. "In economics, demand is the desire to own anything, the ability to pay for it, and the willingness to pay. The term demand signifies the ability or the willingness to buy a particular commodity at a given point of time." The increased "demand" wasn't there until the product was available, and at a price that many considered reasonable, not just the rich. Wishing for something isn't demand. "the only way a net new job comes about is if the consumer has an increase in his own income...often a pay raise or a better job,etc - i.e. productivity." Then a definition for productivity, as you are also using that word incorrectly. "Productivity is a measure of the efficiency of production. Productivity is a ratio of what is produced to what is required to produce it. Usually this ratio is in the form of an average, expressing the total output divided by the total input. Productivity is a measure of output from a production process, per unit of input." In other words, increased productivity means getting more output for less input. It's been going on since the start of the Industrial Revolution. "increased productivity begets increased demand...."
Yes, strictly speaking, that's true, but only by using the correct definition of the word "productivity. from from reduced spending somewhere else. But, darn those pesky numbers, it seems that GDP has increased over time since 1908." no. it implies that IF there is no gain in productivity, individual wealth and aggregate demand that it's new jobs but replaced jobs and certainly not production causing demand. "Your claim that every auto job was offset by a loss in the horse transportation industry looks like it's bogus also. Although this table only includes data from 1661 to present, your claim that there are a fixed pie of jobs seems silly." not my claim. I said that a good number were probably switches from wagon to car and that to assume that all of it was new jobs is wrong rather than replacement jobs is wrong and that is a significant part of demand. "We can see that employment numbers increase over time, as does GDP, and GDP per capita"
that would be NEW/ADDITIONAL Demand.. I would AGREE ESPECIALLY if the folks buying the MOdel T's had more money than they had before due to increased productivity. I can certainly understand why you're reluctant to read economics books!l"
I read the books, have taken the courses, am aware there are different schools of economics but I do not buy a theory of which there are obvious and numerous conflicts in the real world. You're not reading carefully, Larry. First, a definition for demand. You're not using it correctly." I read and understand but I do not buy assertions of which there are obvious problems that are not explained and/or hand-waved away. The increased "demand" wasn't there until the product was available, and at a price that many considered reasonable, not just the rich. Wishing for something isn't demand." but you cannot buy something new if your income is already spent - unless you switch spending from something to the new thing. that "demand" does not create a net new job. when that happens the job for the old stuff no longer bought - goes away. Not a NET NEW JOB unless the person who bought it - himself had more/additional money. Then a definition for productivity, as you are also using that word incorrectly." I'm using it in a practical context rather than a theoretical context so that the understanding of what it is and is not - is clear and explicit. in plain terms - it benefits individuals with more money and in turn creates higher demand for what money can buy. "In other words, increased productivity means getting more output for less input. It's been going on since the start of the Industrial Revolution." indeed - and when a farmer harvests the same crop for the same money and still buys a Model T - it is not new/additional money but instead money switched from another product - the horse and wagon. the example of the farmer makes clear that demand does not come JUST from manufacturing a new product... there has to be an ability to buy it - the "demand". Model T's would not sell to people who could not afford them - no matter their productivity. "Yes, strictly speaking, that's true, but only by using the correct definition of the word "productivity." there is a theoretical explanation for "productivity" but my view is you really do not understand what it really means until you see real examples of it. for example... suppose the farmer actually did double his crop production through longer hours and have his older kids help - but the market for his crops collapsed and he only earned 1/2 of what he usually did. is he still going to buy a Model T? was he more "productive" in terms of how it affects supply/demand? this is how IMHO to tie economy theory to things that can do more than just ask you to "believe" because it is written word or espoused by a "smart" economist. it's got to pass the real world smell test. theories don't drive the economy - which is how some people approach this. theories try to EXPLAIN how the economy works but when a theory is in obvious contradiction to explaining circumstances.. it's a red flag that SHOULD make one reexamine his understanding of the theory and/or to question the theory. My view is that if supply siders and supply begets demanders... would just take a look at the realities they'd see the conflicts and instead of hand-waving them away as "outliers" and "anomalies".. they need to get down to what actually happens at the transaction level to truly understand. if there is no increase in productivity, earnings, income, at the individual level - there is no increased demand. "not my claim. I said that a good number were probably switches from wagon to car and that to assume that all of it was new jobs is wrong rather than replacement jobs is wrong and that is a significant part of demand." There's no "a good number" or "probably" in there. You described a direct 1 for 1 substitution. Larry, here's the thing: You have ignored most of my arguments, and continue to write the same incorrect stuff over and over. You assume a fixed pie, with no possibility of changes in demand without population growth or unexplained increases in income. You won't learn the correct definitions of commonly used economic terms, and fail to understand that demand - a word you continue to misuse - isn't directly related to any particular number of jobs. You don't think you could benefit from reading books, and it's obvious you ignore what others on this blog write when it disagrees with your preconceived notions. I don't know how else to put it, except to say that your ignorance of economics is preventing a meaningful discussion of this subject, and there's little point in continuing. "they took the existing money they normally spent on horse and wagon and got a car." let me amend that to say that SOME of them... not a lie.. but not as precise as it should have been. my point still stands... you have to distinguish between those who had more money to spend and those who changed what they spend their existing - not increased money on. "there not only was a demand for the car but an offsetting lowering of demand for horses and wagons." There's no "a good number" or "probably" in there. You described a direct 1 for 1 substitution." not my intent. I was pointing out that new production does not beget new demand. "Larry, here's the thing: You have ignored most of my arguments, and continue to write the same incorrect stuff over and over." no I don't. you CONTINUE TO IGNORE the fact that fixed income does not result in higher demand.
" You assume a fixed pie, with no possibility of changes in demand without population growth or unexplained increases in income." I ASSUME that demand is not created by production. "You won't learn the correct definitions of commonly used economic terms, and fail to understand that demand - a word you continue to misuse - isn't directly related to any particular number of jobs." it's not a question of learning. It's a question of slavish adherence to a theory that you really do not understand. "You don't think you could benefit from reading books, and it's obvious you ignore what others on this blog write when it disagrees with your preconceived notions. " I read the books, have taken the classes but when theories don't add up to real circumstances, you have to be bright enough to recognize that and you are not and do not. "I don't know how else to put it, except to say that your ignorance of economics is preventing a meaningful discussion of this subject, and there's little point in continuing. " the problem is that the same guy who doubts theories about global warming, does not know his facts on social security.. believes without really thinking ...supply side theories that have obvious contradictions in real life. that's not book learning. that's stupidity in the name of ideology. you have an ideological view and you don't care if it makes sense or not. 3. switched demand does not generate net new jobs - but replacement jobs. 5. - higher productivity = higher income (not always) = higher demand = more jobs to satisfy the additional new demand. 6. demand is not created by increased production. you can double or triple or quadruple the production of paprika, eyeglasses, kumquats and artery stents but it won't increase demand for those things unless people have more money or they switch money from other expenditures. and even then - it does not mean if you double the output of eye glasses that people will buy them if they already have what they need even if eyeglasses are 1/2 what they used to be. People do not buy what they do not need no matter how much is being produced or how cheap it is.